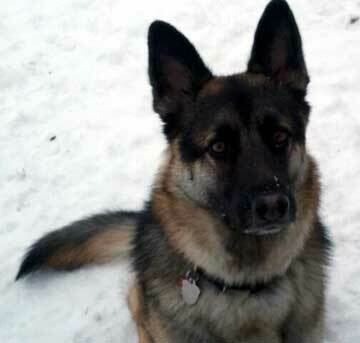 This is my 2 year old German shepherd named Rocco. Rocco weighs in at a lean 87 pounds. He is the best dog I have ever had. Intelligent, handsome, and blessed with a great disposition . I have an 18 month old son who can do no harm to this dog. My son literally sits on Rocco to watch television and pulls his ears and tail whenever he gets the chance. Its almost as if there is a little person wrapped up in all that fur. He understands that my son Luca is part of the family, and will sit back and take every minute of it with out fighting back. Rocco is very protective of my family and believe that he would do anything to keep us safe. Rocco has been spayed and is fed nitro Max with fish oil. Thanks for looking and hope Rocco is a contender for the contest. Handsome! Sorry Rocco-your absolutely beautiful!